Sharing what you are binge-watching on Netflix just got easier. Netflix now enables sharing what you’re watching directly on Instagram Stories. The option is currently available for iOS users only. The new feature can be accessed via Share option in the synopsis page of a title on the Netflix app. Netflix is rolling out a new feature that will enable users to share artwork of what they are watching directly as an Instagram Story. The online media streaming platform joins Shazam, Spotify and Soundcloud in offering this feature. Do note that the share feature is available from within the Netflix app and only for iOS users as of now. The option is expected to be soon made available on Android as well. With the addition of this option, users can easily share artwork of what show or movie they are watching or make a recommendation for their followers and friends. 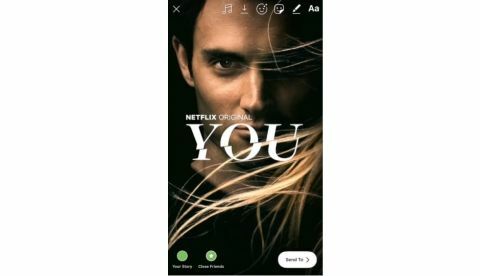 To share artwork of a show or movie as their story on Instagram, users need to boot up the Netflix app and navigate to the synopsis page of the movie or series they want to share. Using the share option here will up a new option called ‘Instagram Stories’ and tapping on it will open up the Instagram app with the artwork ready for sharing to Stories. One can then go ahead and post the artwork like they would post any other Instagram story but those who view such stories will also get an option to watch the show on Netflix. Speaking of new features, Instagram recently rolled out ‘Self Regram’ option that enables users to post images and/or videos on multiple accounts simultaneously. Earlier, when one wanted to post the content on two different accounts, they had to first upload it on one handle and then again by accessing the other account on the platform. For example, if you have two Instagram accounts, a Twitter handle and a Facebook profile where you want to share the same image, you can do it by turning the toggle “on” for the desired handle. Earlier, this was only available for sharing content on single accounts on different platforms. How to connect two PC\'s directly?